Sani-Tab maximizes infection control and patient comfort while saving time and money. From Crosstex International, Sani-Tab is the only chain-free patient towel that features the manufacturer's patented adhesive tabs, eliminating the need for bib chains or disposable straps. Dental bib clips and chains have been shown to pick up dangerous microorganisms from skin, saliva, and other debris, presenting a potential source of cross-contamination. 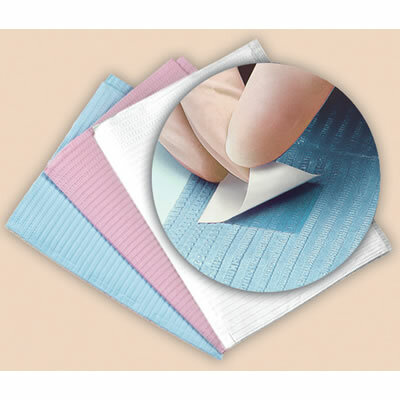 Sani-Tab's adhesive tabs completely eliminate the need for a bib clip and allow the clinician to put the bib directly on the patient without having to repeatedly move it back into place. Simply position the towel anywhere on the patient and apply pressure at the tab area.